You have three seconds to grab my attention. How? Well, according to Helen Sawyer, client director at The Leaflet Company, that’s how long the average consumer spends looking at the materials that land on their doorstep. However, the stronger and more compelling the message, design, and format, the more likely it is those three seconds will dramatically increase. 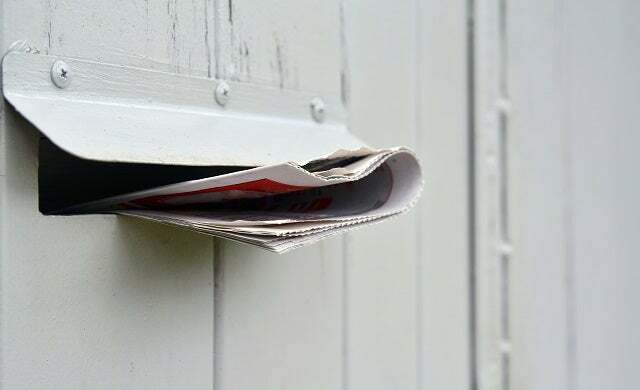 According to research from Royal Mail MarketReach report The Private Life of Mail, if a door drop is retained – it can be kept in the home for 38 days on average. So it makes sense to learn some of the tricks of the trade from big brands and their successful campaigns, doesn’t it. Here, we reveal the cunning marketing techniques employed by four well-known brands to grab a consumer’s attention in some of their best marketing campaigns. Precision marketing is something the ubiquitous pizza franchise Domino’s excels at, says Melanie Welsh, executive planning director at digital agency Havas helia. “For that company it’s about understanding which are the more affluent households, and then targeting those people, right down to a precise street,” she says. Pointing to its ability to target and plan, she says “campaigns are planned 13 months in advance and everything is mapped out really carefully”. Rather than posting door drops as soon as the leaflets leave the printing press, the deliveries are highly strategic, says Welsh. “It has identified its sweet spot as the week that people get paid, so it plans around that and books its door drops in accordingly. Door drops for Domino’s are the second most effective marketing channel after TV, adds David Beale, MD of response, data and analytics at MediaCom Response. That’s why the company spends £10m a year on it. If you can get a consumer to interact with your marketing ideas you’re probably half way there. Whether it’s a physical, digital or other response, there’s a greater likelihood that you’ll see a return on your investment. Gavin Wheeler, CEO of CRM agency WDMP, worked with Freeview on its campaign to promote sign-ups to and use of high-definition television. He says the aim was to find a creative but simple marketing strategy way to capture people’s attention. Big strides have been made in targeting and profiling customers in recent years, says WDMP’s Gavin Wheeler. The more traditional approach to this is to use geodemographics, an approach that identifies likely characteristics of people in an area based on their combined profile. In order to exploit this your business first needs to understand who its core customers are – their age, gender, purchasing history, and extras such as which special offers they respond to most. You can do this by creating a loyalty or membership scheme. Once you have that and can pinpoint on a map where more of them appear to live, you’ll have a target radius for your door drop materials. This is the approach Wyevale Garden Centres took, says Wheeler. “It uses door drops to target a specific market that regularly attends garden centres, and then overlays the data with geodemographics – and this works because we know that similar people live in similar areas to each other. When multi-national conglomerate Bestway Group acquired The Co-operative Group’s pharmacy business in 2014 and re-branded it Well Pharmacy, there was an important PR job to be done. Customers living near one or more of Co-operative Pharmacy’s 780 branches around the UK needed to know it was business as usual, despite the name change. Bestway also needed to stagger the process of communication as not every branch was converted to Well Pharmacy overnight. Door drops provided the best solution. As client director of The Leaflet Company Helen Sawyer points out, “no other form of media would be effective. Radio and local newspapers weren’t appropriate because there was often more than one branch in a town, and one would be changing and one wouldn’t”. As part of its marketing technique, The Leaflet Company created leaflets with three-tiered vouchers which encouraged customers to keep them in their house. Tiered marketing programmes set milestones that customers must pass, whether that’s pounds spent, points earned, or friends referred. This approach not only increases customer engagement, but increases the longevity of your leaflets if people need to hang on to them to claim further rewards. As more stores were converted, the campaign expanded to radio, press and digital marketing. The happy result was that voucher redemption rates were “exponentially” high, with Sawyer deeming the campaign “fantastically successful” thanks to the fact the new brand was seen in a positive light. In today’s market, it’s increasingly difficult to grab a consumer’s attention amongst all the noise of competitors but, with door drop marketing, you have the chance to make an impression with a physical message that’s relevant to your audience. As the marketing ideas from these four brands demonstrate, when done effectively, this efficient marketing method can help you successfully target customers and increase engagement and loyalty. This article was produced in association with Royal Mail MarketReach. For the full collection of insights from the featured door drop specialists and to find out about the New User offer visit mailmen.co.uk/doordrops.